Remove a rival guild from the picture. Find out the mission details from Torsten Cruel-Sea in Windhelm. Travel to Uttering Hills Cave. Once you've completed five additional jobs in the city of Windhelm, speak to Delvin at the Ragged Flagon to receive a 'special job'. Delvin explains that he has received word from a friend in Windhelm of a rival faction of thieves setting up shop. Travel to Windhelm and speak to Torsten Cruel-Sea. He can be found wandering both inside and outside the city walls. Talk to Torsten, and he'll tell you that the faction killed his daughter and stole her silver locket. He has already tracked down her killer and dealt swift justice, but not before learning about the formation of a new, rival Guild. Torsten wants the locket back and revenge on the people behind the murder. He'll give you a name, Niranye, that he prised from the murderer before killing him. She is somewhere in Windhelm. During the day, Niranye is usually at her stall near The White Phial. In the evening, she can often be found in the New Gnisis Cornerclub. Talk to her about Torsten's daughter and she'll express her sympathy over the tragedy of Fjotli's murder. To persuade Niranye to tell the truth, you must pass a hard speech check. You might be a decent thief, but you're an awful actor. (Persuade) Passed: Now, just a moment. Let's think about this... you know, discuss it like two rational people. Tell me everything or end up like Fjotli! (Intimidate) Passed: Now, just a moment. Let's think about this... you know, discuss it like two rational people. If you cannot convince her to tell the truth, you have two options to proceed. The first option is confronting her with evidence to get her to talk. The proof is in Niranye's house, on the side of Windhelm. There is a hidden panel to the rear of the eastern room, which leads to the basement. In the safe to the right of the shelves are the first and second letters from Linwe, the Summerset Shadows leader. The second option is to tell her you've "had enough of this" (one of the dialogue choices). At this point, she becomes hostile, allowing you to kill her without accruing a bounty--nearby NPCs will even help you. You can then loot the letter from Linwe off her corpse. However, if kept alive, she becomes a fence after completing this quest, so the first option may be preferable. Either way reveals that the rival guild were not responsible for Fjotli's death, merely that they looted her body, and that their hideout is in Uttering Hills Cave. Uttering Hills Cave is in the mountains to the west of Windhelm. Travel there, and either sneak past or kill the Summerset Shadow lookouts outside. None of the generic Shadows can be looted for their armor. Inside, on the small table is a leveled poison; when the path splits there is a single Shadow patrolling each tunnel and both paths lead to the same cave. There are two Shadows warming themselves by a fire with a cooking pot, there is a chest beside the fire, and a Corundum Ore vein to the west. The door leads to a circular tower room; at the bottom there is an alchemy lab, and a random potion. Hanging above the lab is a dried Elves Ear and a dried Frost Mirriam. A bandit patrols between the room and the next stairs, and another one is sitting at the far end of the tunnel. There is an adept-level chest on the other side of the wall that the lab is on. 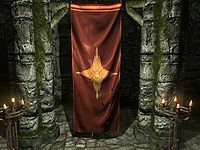 The room to the right contains the Summerset Shadows banner, and when approached will give you the option of burning it, which can be done using a fire spell. Doing so will alert any remaining enemies, so leave it until after they are dead if you want to remain hidden. There is a door to either side of the banner. The room to the left contains two Shadows, one awake and one sleeping, a knapsack, and a leveled potion. The other room contains the Shadows' boss, Linwe, a bed to the left, the One-handed skill book Mace Etiquette on the shelves by the bed, and a boss chest to the right. Linwe is instantly hostile to you and, when dead, you can loot his body for the locket, some leveled weapons, and his armor, boots, gloves and hood. There is no quick way out so you must retrace your steps back outside and return to Torsten. Alternatively you can sneak all the way to Linwe and steal the Locket, staying true to the Thieves Guild code of not killing its targets, though you should be warned that Linwe has a very high detection level. After taking the locket, the quest updates as if Linwe had been killed. The game still reports the Summerset Shadows as being overthrown, even if you haven't killed anyone. Burning the banner is still possible if you have a high sneak perk. Distract Linwe and the other Summerset Shadows to stay at a distance while you burn it, and hide immediately after. Return to Torsten in Windhelm and return his heirloom. He'll reward you with a leveled item, and offer his support to the Guild. Report back to Delvin. He'll give you your pay, and will compliment you on your actions and point out that the added infamy you earned the guild has attracted a new merchant to The Ragged Flagon. In the future, you may be attacked by a Summerset Shadow, presumably in revenge. After completing this quest, three Thief Cache barrels will appear around Windhelm. 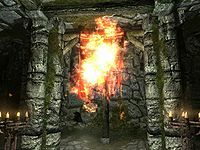 The banner can also be burnt by attacking it with a weapon (either ranged or melee) that has been enchanted with fire damage. Torches, on the other hand, can't be used to set the banner on fire. After accepting the quest it may not start and won't be present in the quest journal. Talking to Delvin again does not solve this, making the Thieves Guild's upgrade quest line broken. ? Talking directly to Torsten Cruel-Sea may continue the quest as usual. The Summerset Shadows Banner may not render properly. You will see a quest arrow marking an empty spot between two pillars. Aim your fire at the location and you will still destroy the banner. Burning the banner may cause the game to freeze. ? The banner looks normal when it is intact, but disappears once it is set on fire. This does not affect the quest in any way. The problem can be solved by first saving, then loading a save in a different area, and finally loading the Uttering Hills Cave save. The optional objective to burn the banner sometimes doesn't pop up. This appears to occur if you kill Linwe before approaching the banner. Once Summerset Shadows has been completed, Uttering Hills Cave will no longer be populated by bandits but with respawning members of the Summerset Shadows. This can be a potential problem if the player has not completed quests that may require this location, such as killing Bandit leaders. To fix this issue, use the console commands prid c5675, followed by disable. 10 Torsten Cruel-Sea, a wealthy merchant residing in Windhelm, has requested assistance from the Thieves Guild. 20 Torsten Cruel-Sea's daughter Fjotli was slain and robbed of a silver locket by a Thieves Guild hailing from Summerset Isle. Calling themselves "The Summerset Shadows," they are looking into expanding their influence in Skyrim. 40 Torsten's daughter wasn't slain by the Summerset Shadows, but their leader, Linwe, has them robbing the dead of their valuables. Linwe and the rest of his guild have established a hideout in Uttering Hills Cave. 60 I've slain Linwe and obtained Fjotli's Silver Locket. This ends the presence of the Summerset Shadows in Skyrim. 200 Finishes quest The locket has been returned to Torsten Cruel-Sea, and the Thieves Guild can now count on him as an influential ally in Windhelm. The following empty quest stages were omitted from the table: 0, 30, 35, 65. On the PC, it is possible to use the console to advance through the quest by entering setstage TGTQ04 stage, where stage is the number of the stage you wish to complete. It is not possible to un-complete (i.e. go back) quest stages, but it is possible to clear all stages of the quest using resetquest TGTQ04. This page was last modified on 19 March 2019, at 23:58.